José Crespo - WHAT DOES IP CODE MEAN? The�IP Code,�International Protection Marking, IEC standard 60529, sometimes interpreted as�Ingress Protection Marking, classifies and rates the degree of protection provided against intrusion (body parts such as hands and fingers),�dust, accidental contact, and water by mechanical casings and�electrical enclosures.�It is published by the�International Electrotechnical Commission�(IEC). The equivalent European standard is EN 60529. The digits indicate conformity with the conditions summarized in the tables below.�The digit�0�is used where no protection is provided. The digit is replaced with the letter�X�when insufficient data has been gathered to assign a protection level. The second digit indicates the level of protection that the enclosure provides against harmful ingress of water.�The ratings for water ingress are not cumulative beyond IPX6. A device which is compliant with IPX7, covering immersion in water, need not be compliant with IPX5 or IPX6, covering exposure to water jets. A device which meets both tests is indicated by listing both tests separated by a slash, e.g. IPX5/IPX7. Vertically dripping water shall have no harmful effect when the enclosure is tilted at an angle of 15� from its normal position. A total of four positions are tested within two axes. Water falling as a spray at any angle up to 60� from the vertical shall have no harmful effect, utilizing either: a) an oscillating fixture, or b) A spray nozzle with a counterbalanced shield. Test a) is conducted for 5 minutes, then repeated with the specimen rotated horizontally by 90� for the second 5-minute test. Test b) is conducted (with shield in place) for 5 minutes minimum. Water splashing against the enclosure from any direction shall have no harmful effect, utilizing either: a) an oscillating fixture, or b) A spray nozzle with no shield. 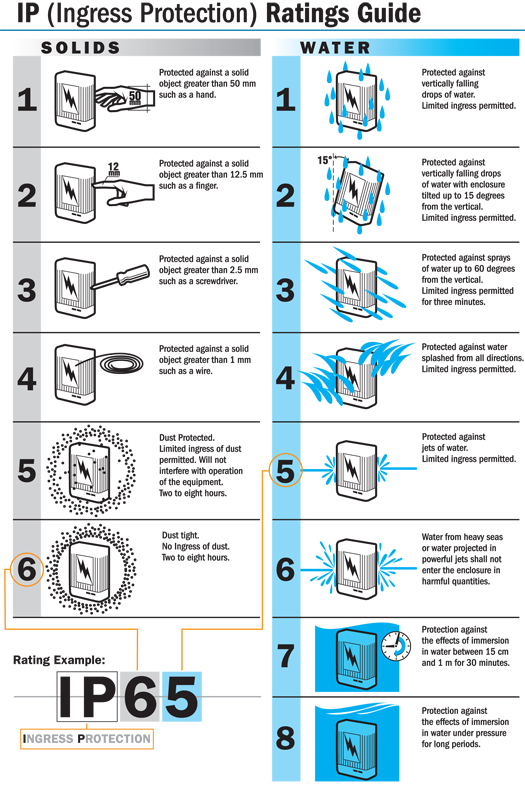 Water projected by a nozzle (6.3�mm) against enclosure from any direction shall have no harmful effects. Test duration: 1 minute per square meter for at least 15�min. Water projected in powerful jets (12.5�mm nozzle) against the enclosure from any direction shall have no harmful effects. Water projected in powerful jets (6.3�mm nozzle) against the enclosure from any direction, under elevated pressure, shall have no harmful effects. Found in DIN 40050, and not IEC 60529. Ingress of water in harmful quantity shall not be possible when the enclosure is immersed in water under defined conditions of pressure and time (up to 1�m of submersion). Test duration: 30�minutes Tested with the lowest point of the enclosure 1000�mm below the surface of the water, or the highest point 150�mm below the surface, whichever is deeper. Smaller specimens rotate slowly on a turntable, from 4 specific angles. Larger specimens are mounted upright, no turntable required, and are tested freehand for at least 3 minutes at distance of 0.150.2 m.
� � � � �All our membrane keypads have an IP65 Degree of Protection (provided that the input slot of the tail to the equipment is sealed), and according to the model and customer requirements we can manufacture keyboards that comply with the IP67, which guarantees a very high level of protection. protection, durability, and good performance over time. � � � Each membrane keyboard is different, contact us and we will find the best solution for your project!